Wow! Thislook is awesome! love the pop up of the sunny yellow especially in a combo with the electric blue! i looove how you mixed the colours! I like this combination. Look very nice. great outfit! i love the blue and yellow and i love this print top! The color of your pants is just insane. I love that shade of blue! The colors came together flawlessly. I’m really in love with that blouse that yellow bag. How did I miss this blog? You have an amazing sense of style and I am so glad you stopped by today! Thank you for commenting and I am very much looking forward to your next post! Fantastic animal printed shirt. Really like the bright pants too. I love your fantastica look. The shirt is love it. And your pants is beautiful. The yellow clutch is such a nice addition to this outfit. Great colorful accent! Gorgeous look!I love yellow and blue together! dear, i love this yellow clutch and the blue trousers. looks so adorable…. and your hair…as always wonderful! love the print of the shirt and color combination…you always do great color combinations! 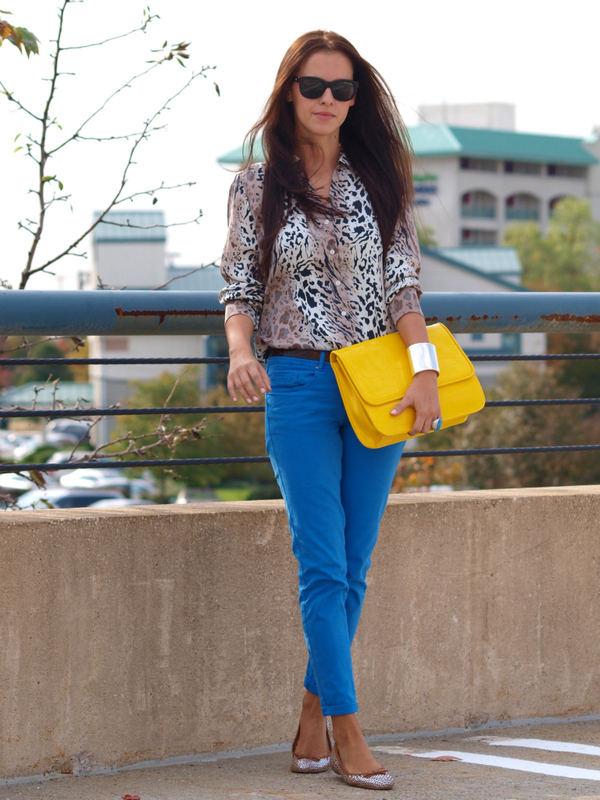 Never enough of blouses;-) Love the blue-yellow mix,amazing bag!Love that you’re wearing it as a clutch! I love the outtfit and the pictures! I am speechless! What an outfit – you have outdone yourself with this one! love ur colorblockin! !u look gorgeous! 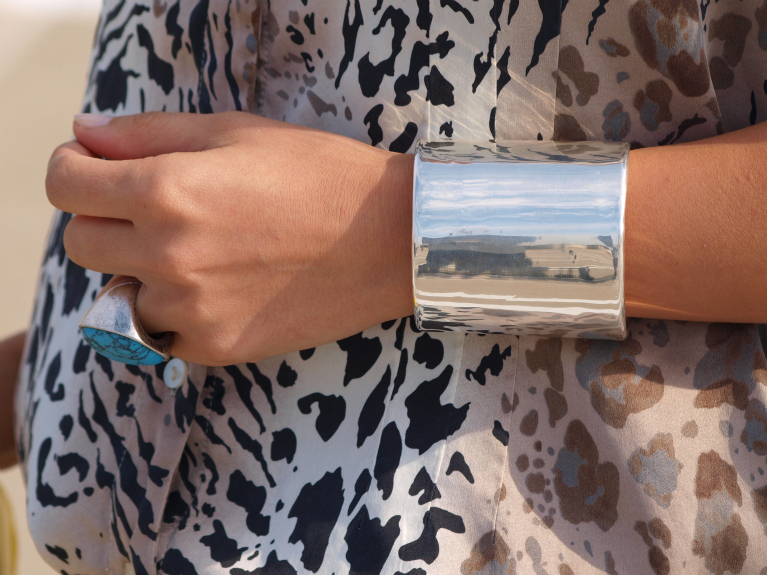 The clutch, the bangle, the ring…the outfit…BRILLIANT!! In LOve with your shirt and ballerinas!!!!! You look stunning (are you a model/was???). Love your style girl!!! love your outfit! i may have to get those pants if they are still available on zara! where did you get your vintage bag? Love the outfit!! the clutch is amazing, great color, it really pops the look! I adore the colors of your outfit! I’m now following you via GFC; #285th follower. I hope you follow back, darling. hello..i think Picasso said this:,,Why do two colors,put one next to the other,SING?can one really explain this?,,…..well,looking at your outfit..i must say,that you have a real sense on colors,because your colors SING!!!! !…nice job! You are right – shirts never go out of style! And, darling, you look great in this one! great color combinations! I love your yellow bag! LOvely! The pictures are blowing me away. I’m definitely subscribing to your blog! Please check out my blog when you get a chance. beautiful dear, jacket, blouse and that bracelet, super! The yellow and blue prints should dare, but still the combination of all this is superb frankly nothing to complain!